Kenton's Infotainment Scan: Citigroup cites 51st State of Denial, R.E.M. ABC News This Week reports this morning that Citigroup has issued an economic forecast memo called "the 51st State of the U.S.A. - The State of Denial," which clearly shows the bank using the cover of R.E.M. 's single, "It's the End of the World as we Know it (and I Feel Fine)" front and centre. I can't find a copy of the memo anywhere online, but it's clearly visible in this link to the This Week interview with Treasury Secretary Tim Geithner, at 2:12 on the countdown clock. What's this about? 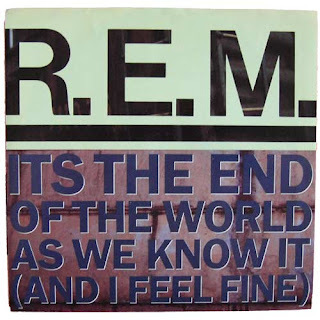 Have R.E.M. fans grown up and started working at Citigroup? Can the "Everybody Hurts" economic forecast be far behind?